When it comes to soloing raid instances for mounts and mount collecting in general, the classes you use makes difference. Gear can be important when soloing a raid, but only when you get closer to content in the last few expansions. When there is a large gap between your character’s level and the level the raid was intended for, you don’t need to worry so much; see the Hidden Item Level Buff section for more. If you are running raids close to the current expansion you’ll need to be at the current level cap and in good gear – you can’t be a fresh 110 in Legion trying to solo Warlord’s raids for example! Of course, whilst excessive DPS can handle most bosses, there are some – like the Spine of Deathwing – where execution becomes key. One reason why I’ve been writing these 101 guides. Tank classes probably have the easiest time soloing most bosses – after all, their role in life is to survive being hit in the face by the boss after you told them their mother was a hamster and their father smelt of elderberries. However tanks need to do sufficent damage to kill the boss within the enrage timer – if there is one – or before soft enrage mechanics kill you. A good example this is the 3rd boss in Mogu’shan Vaults, Gara’jal the Spiritbinder. When I was trying this on my Blood DK early in Warlords, just one expansion after it was released, she had issues until her gear improved. When soloing Gara’jal, you can’t go into the spirit realm. This means the mobs within the spirit realm start to build up relatively quickly. At first their shadowbolts only tickles, but as more & more spirits spawn that damage effectively acts like a soft enrage. And it was one which killed my DK before her gear improved. With better gear she could survive the damage longer and DPS the boss harder. Hunters are a very good at soloing – if they’ve got a pet to hold threat. I tend to run my hunter as beastmaster with a turtle pet for their damage reduction ability. In Warlords I found my hunter could happily solo get farm Horridon for its mount, with the ability of a hunter pet to pick up adds with thunderstomp and for my hunter to mistirect the adds which spawn to the pet made it a breeze. Warlocks – with a tanking pet – can do some soloing, but they aren’t in the same class as a hunter. Thus my warlock couldn’t survive the waves of adds Horridon had. But get her to an instance where Megaera was dead and she was more than capable of soloing Ji’Kun for its mount. Often so long as you have a well geared DPS character with some self healing you can get far. My main is a shadowpriest so tends to be the best geared out of my characters. That, combined with the shield and heals shadowpriests have, means he is very good at soloing even recent older content. So towards the end of Warlords he was happily soloing Ji’Kun for the mount as well. Sometimes you just need to poke the raid and see if its possible or not. And sometimes things change over time – for a while the first boss in Throne of Thunder wasn’t soloable without tricks as when Jin’rokh picked up its target to throw it he’d reset as he’d not have anything else to focus on. The tricks involved having pets become the focus of his attention instead – eg I know that it was soloed by an unholy DK thanks to the perma-ghoul they had at the time. Blizzard did fix Jin’rokh to not reset whilst his only target was flying through the air after they were made aware of it; its not surprising this bug existed given most raids were running with more than one player during Mists! 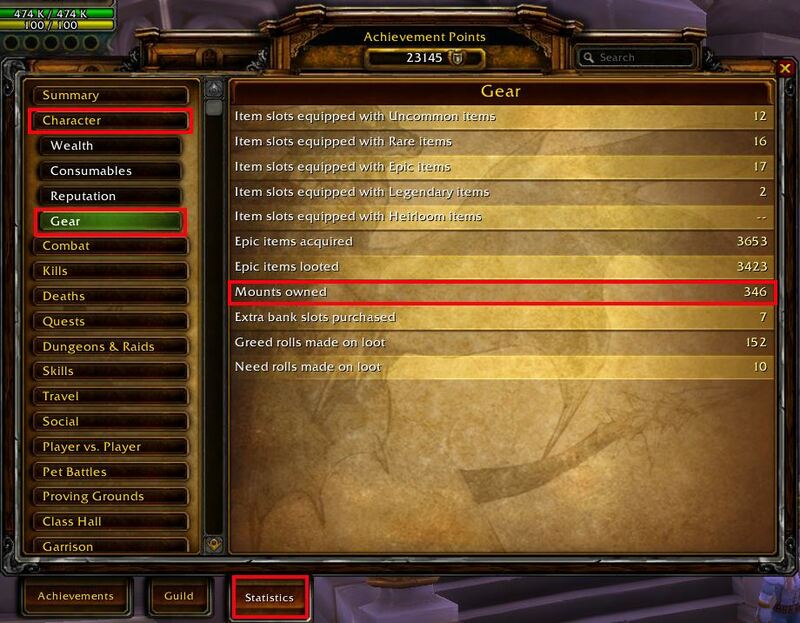 The various mount collection related achievements like Mountacular – collect 250 mounts rely on the count of mounts your character has; but this isn’t the value seen on the mount tab of the collections window. That count includes all the cross faction mounts which aren’t double counted – for example you can’t get 10 mounts by getting all of the PvP mounts for honor on both horde and alliance side – you’ll only end up with five. In a similar way that Reins of the Spectral Steed for the Alliance and Reins of the Spectral Wolf for the Horde – both from Tol Barad – are counted as one for achievements. For achievements you need to look at the statistics tab of the achievements window. It is under the Gear -> Character area -> Number of mounts. You could also look at your current mount total on your current mount achievement, but that stops working once you’ve gone beyond the 300 mounts of Lord of the Reins as there isn’t a mount collection achievement beyond that. You’ll find that different characters and classes will have a different number of mounts. Profession mounts seem to be counted on all characters, even if they don’t have the required profession to use them. Note that this is before the class mounts of 7.2 were added; once that happens – and you’ve done the per-class quest chain – every class will gain a class mount. The classes with free mounts – Warlock, Death Knight and Paladin – have two class mounts available from quests at level 20 and level 40. However my achievement character is my Paladin thanks to her having three class mounts – the ones which come as you level and also the Argent Charger which comes from the Argent Tournament for 100x seals. So whenever I’m looking at my total mount count I do so on my paladin. The priest has one more mount than you’d expect thanks to him having the Prestigious Bronze Courser – which isn’t currently an accountwide mount. Apparently this will be changing once 7.2 is released. Hopefully. Otherwise my paladin will be grinding the honor along with my priest! The Demon hunter is curious – she only has 346 mounts, not the 347 you’d expect as Demon hunters have the Felsaber class mount. I’m guessing this is likely a bug. Before the item squish Warlords brought in, there had been an exponential growth in gear power over the course of Warcraft’s life. Mostly thanks to the gear of a new expansion building on the best the previous expansion had to offer. The player power was effectively an exponential curve as Blizzard have always prefered to have upgrades be meaningful. This increase in power meant players could easily solo vanilla raids when Wraith of the Lich King came around. The content drought at the end of Wraith probably helped here! When Blizzard were developing Warlords, they accepted that there was part of the community who liked soloing old raids for transmog, mounts and pets. And they also realized that the item squish – which turned the exponential power curve into a linear one – would impact those players. To counteract this, Blizzard added hidden buff in all content which came before Mists – the larger your ilevel difference between yourself and the mob, the greater the buff. The end result is that raid content was just as easy to solo – almost easier in fact – after the item level squish. However Mists content and all expansions which followed it do not have this buff – the end of the linear power curve was normalized to them. This entry was posted in Classes, Mount farming 101, Mounts. Bookmark the permalink. Tank also do not face some of the raid mechanics which trivialized some of the encounter when soloing. The nominal first boss in Fireland will never stun the tank. Not that it makes much differences now with the gear level differences. That is true, although sometimes the “tank” part is implemented as “Current threat target” instead of tank spec.